I was in a major cooking rut over the holidays. This is pretty common for me. Maybe it’s all of the sugar, the alcohol, and the decadent foods I consume over the holidays. During this season, I am just way too tired/lazy/hungover to cook a decent meal for myself. It was no different this year. I needed some major encouragement, inspiration, or coaxing to get back into the kitchen. Luckily, I found some over at Google +. Yeah, that’s the platform that “no one” is on. But I like it. And I like the people I’ve met there. Many are food lovers and great cooks/chefs. Many of the dishes that they create look divine; but one stood out for me for it’s oh-so-comforting qualities. I try to eat a balance meal, but I ONLY crave comfort foods in the winter. That’s not an exaggeration. If I can help it, I wouldn’t touch any raw vegetables or fruits. I like things simmered, soft, and piping hot. And this Chicken and Dumplings totally fit the bill. I’ve adapted the recipe to make it gluten-free and dairy-free. I have made chicken noodle soup from scratch many times, but never chicken and dumplings. And I was happy to find the preparation almost identical – excepting the dumplings. Although it may be a tad bit time-consuming and tedious, it’s not difficult to make. Especially if you are cooking for two, as I usually do. If so, you can make this last up to 3 meals. You just need to replace some of the stock with some store-bought (or homemade) stock. It is SO worth it. The complete recipe will be at the bottom of the page as usual. But here is a very brief version of the it with photos. I hope the photos help. While the chicken is boiling, prep the vegetables. Once the chicken is done cooking, remove and cool the chicken. In a large pot, saute the prepped vegetables until the onions are translucent. Add the seasoning to the pot and mix. Then, add the stock to the pot. Allow the contents to come to a boil and simmer. Shred the cooled chicken and season. Whisk together the dry ingredients for the dumplings. Add the oil and the almond milk and mix. The texture of the dough should not be too wet. Once the soup has simmered, add the chicken and parsley to the pot. Mix. Drop the dumpling dough into the pot using a tablespoon. 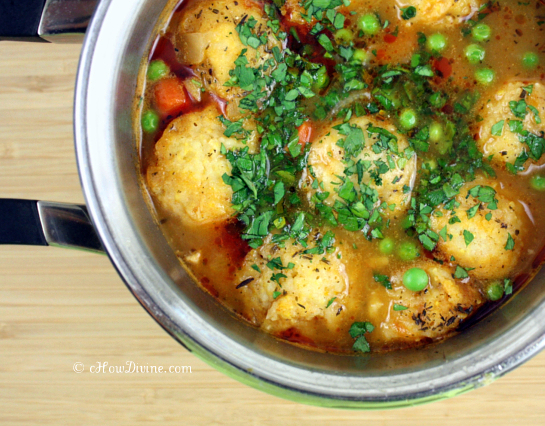 Simmer until the dumplings are tender and cooked through. In a large heavy-bottomed pot, add the chicken, 1 bay leaf, 4 cloves of garlic, 1/2 onion, 1 celery rib, 1 carrot, kombu (if using), and water. Under moderately high heat, allow it to come to a rolling boil. Turn down the heat and simmer for another hour. If you are using a pressure cooker, 30 minutes under pressure will suffice. Discard the vegetables using a a slotted spoon. Remove the chicken from the stock and allow it to cool. Set aside the stock. While the chicken is cooling, heat another large pot over moderately-high heat. Add enough oil to coat the bottom of the pan. 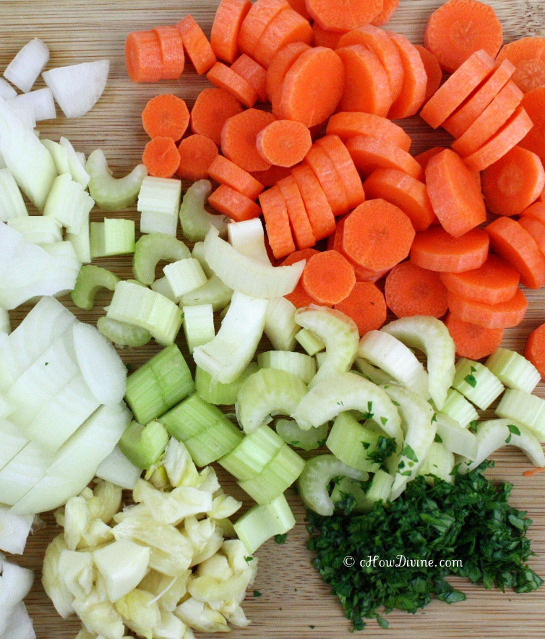 Add the chopped onions, carrots, celery, and garlic cloves until the onions become translucent; this shouldn’t take more than 3-5 minutes. Add tomato paste, bay leaf, thyme, and 1/2 tsp salt. Stir well. Add about 6-7 cups of the reserved chicken stock from step 1 to the pot. Add about 1/2 tsp of salt. Allow the contents to come to a rolling boil. Turn the heat down and allow the contents to simmer for about 20 minutes. 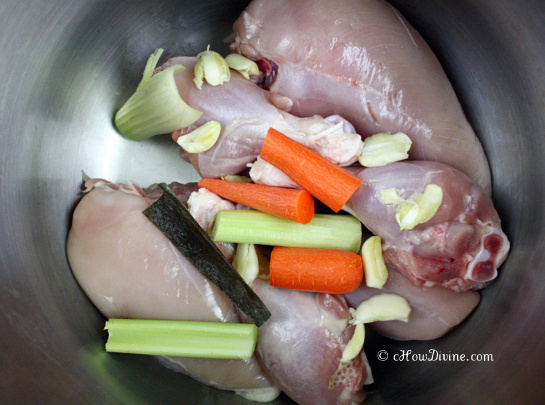 While the soup simmers, prep the chicken by pulling the meat off the bones. Discard the bones and cartilage. 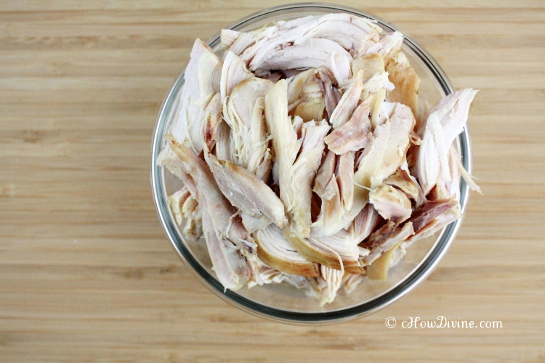 Toss the shredded chicken meat with 1/2 tsp each of salt and pepper. Set it aside and prep the dumpling dough. 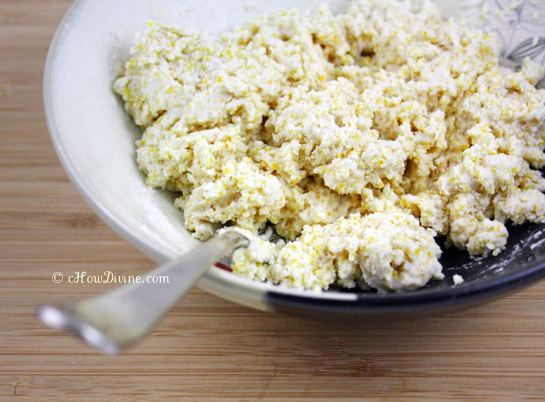 In a mixing bowl, sift or whisk together cornmeal, rice flour, tapioca flour, potato flour, salt, and baking powder. Add the oil and almond milk to the dry ingredients. Mix gently until just incorporated. Don’t overmix. The dough will look closer to a biscuit dough, not pancake batter. Once the soup has simmered for 20 minutes, add the chicken and parsley. Stir. Then add the biscuit dough to the simmering pot using a tablespoon, by scooping up the dough one tablespoon at a time and dropping it into the soup. Don’t stir* and allow it to simmer for another 15 minutes with the lid tilted. With about a minute left in cooking time, add the frozen peas. Taste test. If necessary, add salt to taste. Divide into bowls and garnish with chopped parsley if desired. Make sure that the soup is HOT, when you drop the dumplings in. Additionally, make sure that the dumplings are dropped in a single layer on top. Do NOT stir until the dumplings are set. These dumplings don’t have the gluten (or xanthan gum) to act as a strong glue. You don’t want parts of the dumplings in a heap at the bottom of the pot. I always squirt a little bit of fresh lemon juice to the bowl right before digging in. It really brightens up the flavor. I also love a little bit of sriracha or gochujang (Korean chili pepper paste) in this soup. If you do not need to follow a strict gluten-free diet, mix some in with a little bit of soup. See how you like it. It really gives it a great kick of flavor. If you are cooking for two, store the unused portion of the shredded chicken in an airtight container separate from the soup/stock. Don’t put the shredded chicken in the soup until ready to consume. Additionally, you can make just half of the dough for dumplings. It should be more than sufficient for two people. Just throw in some more veggies and make a new batch of dumplings when you reheat the leftover soup. 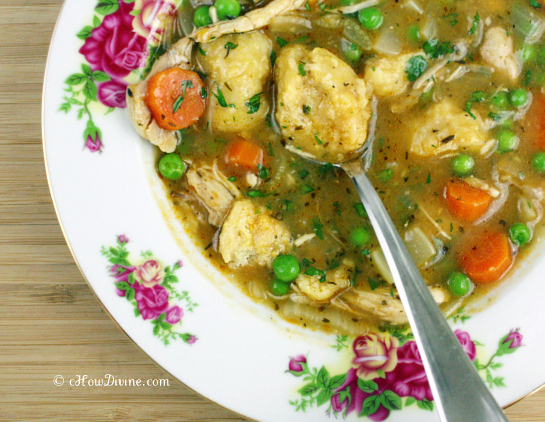 Nothing says winter more than piping hot stews and soups that simmered on the stove for a long time…but even in the peak of the summer time I wouldn’t be able to say no to chicken and dumplings! :) Your version looks amazing!!!!! You stalker you 😛 That why I love you Sandra! Well, seems like with this dish you came out of the cooking rut just fine! I love the soups of this texture! Hi, I’m new here. All your recipes looks delicious. I’ll be making this soup tomorrow, what can I substitute for tapioca flour? Can I just add more cornmeal and potato starch if I can’t find tapioca flour? Thank you for the recipe and clear explanations! Thank you Nat! I’m so happy you enjoyed this dish. Chicken gizzards, what an interesting twist! 😀 I hope you are having a wonderful week!